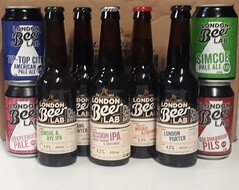 Join us and fellow beer enthusiasts at London Beer Lab in Brixton on Sunday the 5th of May at 1 pm. During the course of this session, we'll sample a range of beers from some top London breweries. Q. How many people attend an individual beer making session? A. Currently we take up to 15 attendees at one of these sessions. Attendees work together to brew the 4 or 5 beers begin brewed at a particular session. Q. I have a voucher from a third party site, how do I book a session? A. Please email us with your booking reference and the date of the session you would like to book. Q. What equipment is included in the starter kit? Q: Is prior brewing experience required? A: No brewing experience is assumed and this workshop is suitable for complete novices. Q: I would like to brew at home, is this course suitable for me or do you require expensive equipment to brew at home? A: While the equipment we use may not be entry level equipment for someone taking up brewing as a hobby, our instructors are all home brewers and can advise on different methods and equipment during the course of the workshop. Q: Could you give a brief outline of what is covered in this course? A: To start we will measure out grains as per recipe provided and mash in. During the mash our instructor will give an overview of the whole brewing process from start to finish, while sampling different grains and hops. After the mash, we will need to sparge the grain prior to bringing the wort to the boil. Once boiling, hop additions will be made prior to cooling and transfer to a sanitized fermenter.